Learning how to clean a fish tank is an important part of keeping fish pets. 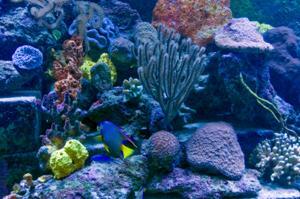 Cleaning a saltwater fish tank is different from cleaning a fresh water tank. Please note that this article assumes that your tank is fresh water. You should clean your fish tank regularly, skimming debris from the top of the water and periodically cleaning the glass to reduce excess algae. Remember that some bacteria in the water is desirable. Be aware of this if you decide to strip the tank completely and start over. This is not advisable unless the tank turns out to be unsalvageable. You might need some old bath towels for water spills. Unfortunately even the easiest of fish tank cleaning methods can be messy and wet. Most people keep their aquariums on tiled floors or in rooms with tiled floors, but you want the towels on hand to prevent puddles and more. The first order of business is to clean the inside glass of your fish tank. You'll need your algae pad and an algae scraper. You can find these items at most aquarium supply stores. Do not use your aquarium cleaning supplies for any other tasks. Any soap or detergent that is on your pad or scraper could kill the fish in the tank. With the pad in hand, scrub the algae off the inside of the glass (you can buy long-handled scrubbers too if you don't want to put your hands in the water). If any of the algae is stubborn and won't come loose, use your plastic blade. Many aquarium tanks are made from acrylic, so the plastic razor or knife won't leave score marks in the glass. Once the glass inside your fish tank is clean, it's time to take out all the artificial rocks, plants, coral and decorations inside the tank. Do not use any soap to clean them. Instead, scrub them with the algae scraper. If they are not fully clean, you can soak them in a 10 percent bleach solution for roughly fifteen minutes. Use a bucket you have designated for your fish tank only - any soap residue that gets on any item put back in the tank could kill your fish. Afterwards, rinse them thoroughly and leave them to air dry. The air dry will eliminate the remaining bleach. Be certain they are completely dry before you put them back in your tank. While the inside glass and decorations are air drying, use your water siphon to vacuum loose debris and dirt from the gravel. You can find a good water vacuum or siphon at your aquarium store. Some will siphon the dirty water right into your sink and others will actually use a filtration to siphon the dirty water through a filter so you can put the water right back into the tank. Whatever water siphon you use, be sure to follow the instructions specifically. Clean the outside of the tank (the hood, light, tank top and exterior glass) with vinegar based cleaners or a cleaner designed specifically for an aquarium. Standard glass cleaners use ammonia and that can be toxic to a fish tank. Whatever cleaner you use, be sure to wipe it all down with water so that no cleaner remains. You are almost done. But the next step requires that you wait a week or two. You've cleaned the interior of the tank and stirred up debris (including the good bacteria you want in the tank), so now a lot of what remains will head straight for the filter. After about two weeks, you are ready to either clean out your filter or change it. A lot will depend on the type of filter you are using so check the instructions associated with it. This method is how to clean a fish tank that's in bad shape. After a cleaning like this, you can go to maintenance cleaning for the most part. Scrape the interior glass on a weekly basis, clean the gravel whenever you do a water change and if you see growing algae or debris on the decorations, pull them out for the soak clean and air dry. As standard maintenance, you should clean the filter monthly or follow the filter manufacturer's instructions on standard cleaning. A clean fish tank is a beautiful fish tank and once your tank is in shape, it won't take that much to keep it looking great.